This week we’re profiling a real-world Twitter Success Story from New York PR firm, Candis Communications, and its owner, Will Candis. Acting on behalf of his clients, Will’s astute Twitter tactics helped a local boat tour operator generate over $2000 in sales. In another campaign, he got over 100 bankers to dine out in a variety of New York’s famed Little Italy restaurants. Here’s how he did it. Candis Communications is a boutique PR firm in New York City, NY, that specializes in the hospitality sector. It’s owned and operated by publicist and principal, Will Candis. In the 10 years or so that Will has been running his agency, he’s become a specialist in leveraging localized knowledge, contacts, information, and events, to craft highly targeted marketing messages for his clients. With the advent of social media, and Twitter in particular, Will saw an opportunity to combine his existing PR skills with the rapidly evolving world of social media marketing. He uses this medium to intricately connect the dots between his clients and their customers. Candis says traditionally, PR was used as a broadcast medium, but “suddenly I saw customers in my clients’ target markets talking amongst themselves on Twitter,” he says. Using his other PR skills such as research, partnering, and information dissemination, “I figured out a way, not only to join these conversations, but to bring other resources into those discussions as well”, he adds. 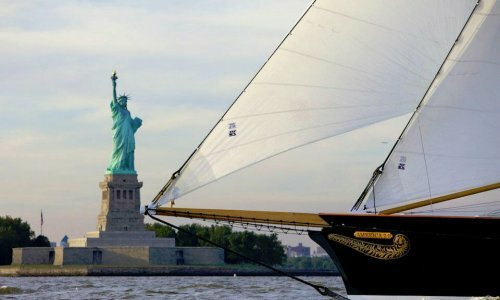 A great example of how Will used his knowledge of a hyper-localized market environment to benefit a client is the work he did on behalf of Classic Harbor Line — a boat tour operator based in New York City’s harbour district. 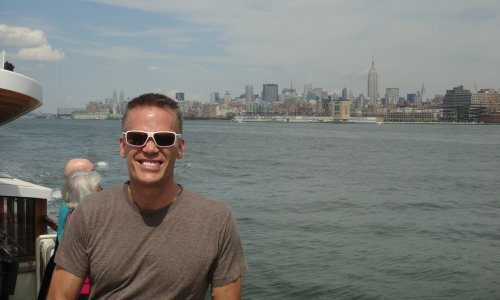 Tweeting for @ClassicHarbor, Will not only posted about standard cruises being offered, he also used the popular local Twitter trend “#beer” to identify a unique market niche. He recommended and promoted a beer-tasting cruise for the tour operator, which turned out to be a smashing success! Another tactic Candis used for Classic Harbour Line was involving other local businesses in its Twitter marketing campaign. Knowing the concierges from a number of hotels in the area, Candis found them on Twitter, and tweeted them exclusive boat tour offers that they could then pass along to their guests. 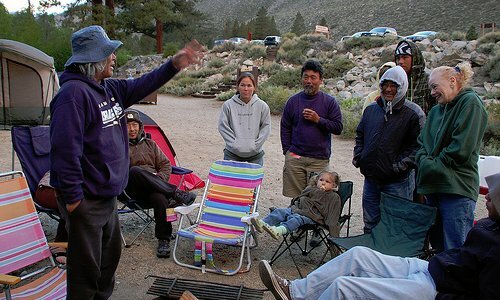 “I know that hotel visitors in that area are always looking for things to do. We made it easy for the guests to find out about Classic Harbor Line by involving the hotels that operated in our area,” said Candis. The net result was a triple win — the client, its partners, and its customers benefitted from Candis’ intimate knowledge of the local environment. If you read a newspaper, use the Internet, or watch TV, you know that Wall Street bankers are not quite as popular as they once used to be. In fact, when New York-based restaurateur and media personality, Mario Batali, called bankers “greedy,” Candis Communications saw this as an opportunity for its client — The Little Italy Business Association of New York City — to get a little positive PR (and more patrons to its restaurants). Acting on behalf of the Little Italy Association (@LittleItalyNYC1), Candis created the hashtag #Bataligate. 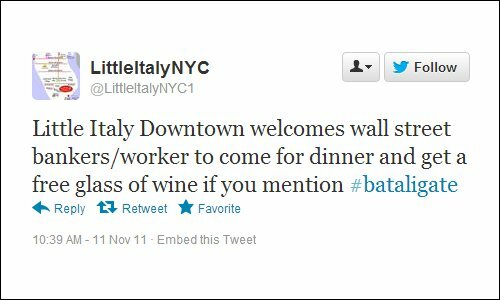 Participating Little Italy restaurants offered a free glass of wine if patrons mentioned that they saw the #Bataligate hashtag on Twitter. The tweet (pictured above) was retweeted over 20,000 times. Clearly, Candis’ methods were perhaps a little cheeky, but it’s hard to dispute the results of such a successful Twitter marketing campaign. “Good PR agencies tell good stories about their clients,” says Mr. Candis. 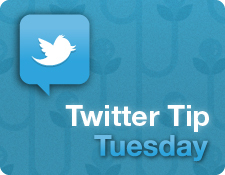 “Twitter has allowed us to tell those stories more effectively, to a very targeted audience,” he adds. In order to add depth and also to increase the likelihood of creating a desired action from your Twitter marketing, take a lesson from Candis Communications: research your target market and include information in your tweets that resonates specifically with them.